Happy Piasso Lapis Lazuli Bracelet size 6 1/2"
Happy Piasso and Rudy Willie are a Navajo couple and silversmithing team who work together to make their creations. They use fine natural, untreated stones in their work and the pieces are marked with Happy's hallmark. Here's a nice departure for Happy and Rudy in making a Traditional Revival design characterized by rich texture achieved through appliquées decorating the cuff. A variety of starred buttons in combination with large crosses framing this teardrop of natural lapis lazuli make for a solid composition of imposing beauty. Deep stampwork and sculpted edges further enhance this split-cuff design with its rich cobalt blue stone. Hallmarked H. Piasso and stamped Sterling on the inside. 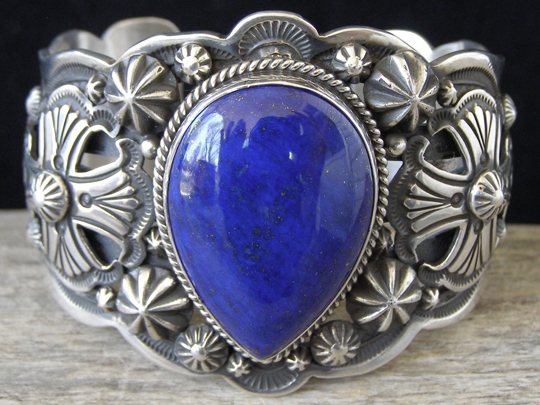 Lapis lazuli stone: 1 3/8" x 1"
Width of cuff at center stone: 2"
Width of cuff at terminals: 1 1/8"